Annotations in Google Analytics have been a great way to mention changes or important information. This was not available in AdWords. 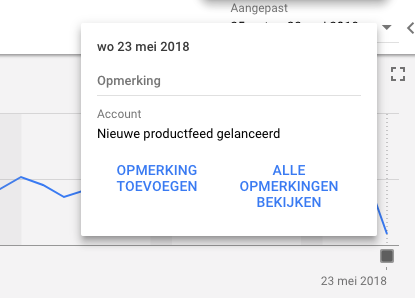 In AdWords you would always have to look at the change history. If you’d have a lot of CPC or ad changes, the cause of big changes was difficult to find. External events, such as a new product feed, depletion of budget are not found in AdWords campaign or ad group changes. Today we found out in some accounts that you can make annotations as well. You can set your annotations for the whole account, on campaign or ad group level.